A few weeks ago, a group I founded was scheduled to go before the Boone City Council to ask for an ordinance allowing people to keep backyard chickens in our town. The morning of our meeting, an officer of the Boone Police Department made a meme to mock my efforts to legalize chickens in town. He took my Facebook profile picture and photoshopped it over Sigourney Weaver’s face on a poster for the movie Gorillas in the Mist. He also photoshopped a chicken head in place of the gorilla’s head. The meme was posted in the Boone Community Page on Facebook, where nearly eight thousand members of our community interact daily. If you’re familiar with the movie Gorillas in the Mist, you know it’s the story of Dian Fossey, the American primatologist whose brutal murder in 1985 for animal activism was very likely committed by government officials who opposed her work. The community page is a place where this officer often posts and reposts information from the Boone Police Department: ordinance Q&A, upcoming “Shop with a Cop” activities, and Citizen’s Police Academy advertisements. It’s a place where he regularly speaks as a member of the Boone Police Department in addressing public concerns and soliciting information. The meme hadn’t been up long when I saw it. 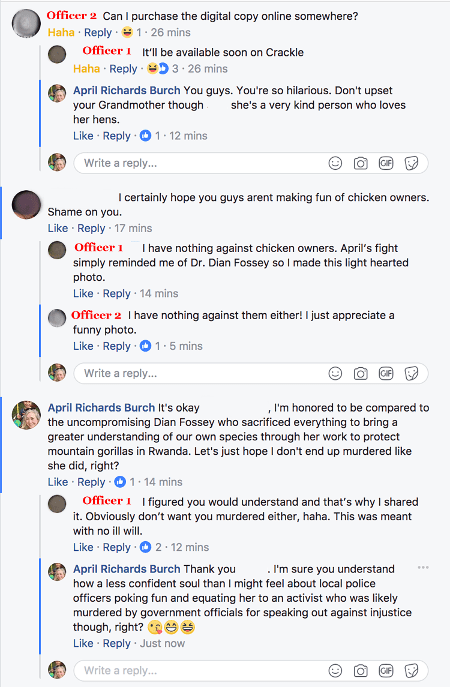 In the comments on the post, the creator and another police officer joked about Chickens in the Yard: The April Burch Story being released on Crackle, a movie streaming website. I told the cops that they were funny and that I was honored to be compared to the uncompromising Dian Fossey. Submissive acknowledgement of the threat: It was an automatic response. The officer who created the meme said he thought that I would appreciate the reference. I reminded him of her. Except for the murder part. “Obviously don’t want you murdered, haha,” he wrote. I grew up in this community. I know all too well how cruelty and comedy go together in the minds of some. I learned young to laugh it off so that they wouldn’t know how scared I was or how threatened I felt. Online, I told the cop that a less confident soul than I might feel threatened. In my home, I sat shaking and couldn’t figure out what, if anything, to do. He said it was a joke. But he didn’t say he was sorry. When the officer deleted the meme from the community page minutes after making the “don’t want you murdered” comment without a direct or unquestionable apology, I knew that he knew that he had made an error in judgement by posting the meme in the first place. I sent both of the officers a friendly message telling them that I had no hard feelings about the meme to give them an opening to make an apology or discuss it. I let them off easy so that they wouldn’t feel threatened by my comment on the post about hoping not to be murdered. They didn’t respond. They held all of the power in the interaction and they didn’t see an obligation to respond. It wasn’t until I sat staring at my message to the officers that I realized how deeply submissive my response was. I felt threatened, but there I was, comforting them. Letting them off the hook. I’ve been a victim of violent crime twice in my life, and it wasn’t until that moment that I realized how deeply those experiences affected me. My mind raced. I decided that I needed to say something more, to speak out publicly about the true impact of the post. In the end my decision came down to one consideration: What if he treats more vulnerable people even worse than he treated me? It was likely. People who don’t know where to draw the lines of civility in public often act with even less respect for others in private. Juvenile antics among local cops might not feel frightening to casual observers, but when you’re the target of a threat shrouded in humor, it feels different. I was angry with myself for not revealing how bothered by the meme I had been. I blamed myself for catching their attention in the first place. I felt guilty that I tried to comfort them in a backward attempt to protect myself and my family by allying with an aggressor. I decided that maybe some joking around was what was needed after all, but not the kind of potentially sinister mockery engaged in by the officers. I saw an opening for humor that didn’t carry any undertones of government sanctioned violence. I asked Dean Erickson if he would like to run for mayor on a write-in campaign. He was game. His only requirement was that his campaign signs could use the slogan “A Chicken in Every Lot.” It felt right to turn the other cheek and create a moment of self-deprecating humor and folly. If nothing else, it served to lift the dark cloud hanging over us since the council’s vote against backyard chickens. We haven’t completely cleaned out the coop yet, but the election was a good start toward bringing fresh ideas and a new wave of civic engagement to our community. For many though, it was more than a frivolous joke. It was a way to fight back, to pull people together, to show them that none of us would be silenced by intimidation tactics of any sort. Our voices mattered, even if local authority figures acted as if they did not. It wasn’t our only effort dedicated to “getting out the vote.” We also hosted Saturday morning public discussions every week for seven weeks straight — to learn about municipal government, revenue, spending, economic development, and important issues facing our town. 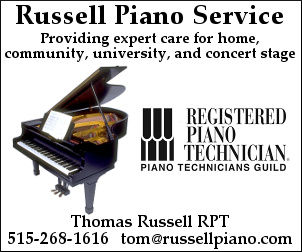 Candidates canvassed extensively, knocking on every door and talking with every resident they could. Even though a newspaper-sponsored candidate forum was cancelled at the last minute when incumbents cancelled their commitments to appear, the challengers hosted their own public forum and made an extra radio appearance. Through these efforts and many others, the seemingly impossible was achieved. Three out of the five reform candidates running won their races. Small business owner Holly Stecker defeated the Republican Central Committee chair for the at-large council seat with over 55 percent of the vote in a four-way split. Elijah Stines, an Iowa State University associate professor in mathematics, took over 62 percent of the vote to win in Ward 3 against an incumbent who had served for over a decade. Iowa State University metals research scientist David Byrd won the Ward 1 seat with 64 percent of the vote. We haven’t completely cleaned out the coop yet, but it’s a good start toward bringing fresh ideas and a new wave of civic engagement to our community. I remain hopeful that leaders in the Boone Police Department will make some departmental changes as questionable online behavior of their officers comes to light. I hope that the officers themselves learn to take the honor and duty that come with wearing a badge more seriously. I hope that they learn about the power to incite fear that comes with the responsibility to protect. In our community, we talk about bullying and worry for our children when they encounter it. We spend a lot of time wondering if lines have been crossed, yet still don’t know where to draw them. Perhaps a good place for all of us to start would be to consider the relationships and the balance of power when the temptation to mock someone arises. If someone possesses legal power to detain, enter a home against a resident’s will, or even kill without consequence as an officer of the law, perhaps he shouldn’t be cracking jokes with sinister undertones about the people he swore an oath to protect. Maybe he should stick to dad jokes instead. 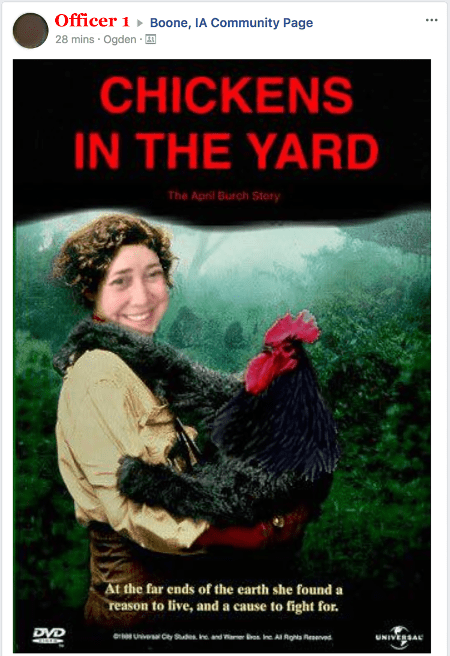 April Burch is the founder of The Backyard Chickens of Boone, holds a bachelor’s degree in Iowa Nice (anthropology, tbh) and is working towards her master’s in sustainability at Harvard University.